Liberty Stadium – Saturday 21 February, 8:30 pm. Swansea City welcomes a rugged Manchester United side at the Liberty Stadium as Premier League action resumes from this weekend after an action packed Cup ties last week. The visitors will be looking to close gap on defending champions and local rivals Manchester City, who are currently five points ahead of the Reds in second place, with a win over Swansea. United have been patchy throughout the season under Louis van Gaal but are grinding out the results like yesteryears. 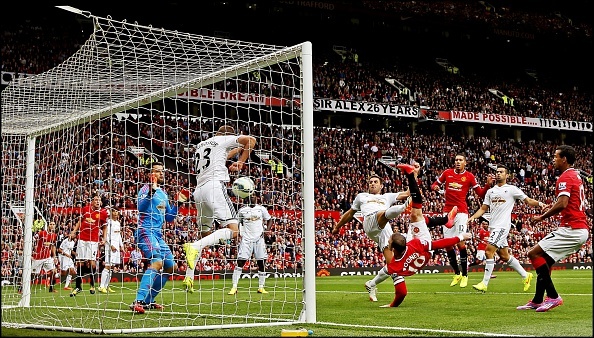 Swansea shocked United in the reverse fixture on the opening day of Barclays Premier League season. Ki’s shocker and Gylfi Siggurdsson’s cool finish handed the hosts their first opening day defeat in quite a while, marked the inauspicious beginning of the Van Gaal era. That is now history as Manchester United has undergone radical changes in the months gone by. From the opening day, back three to a more fluid but less ‘stable’ back four, the boys in red are having one experimental season. Injuries have plagued United all along this season. Although their woes have subsided considerably since the turn of the year, they will still miss two of their key players in Michael Carrick and Phil Jones. The boys in red are never out of the news. The pressure of injuries might have eased off but the form of their leading front-men is another cause of concern for LvG. Radamel Falcao and Robin van Persie so far have been below par; in fact below par would be an understatement. There are cries from media and fans alike to shift Wayne Rooney higher up the pitch from his current role as the holding midfielder. It remains to be seen if the Manchester United captain returns to his favored position or not. Falcao may drop to bench in favor of either Wayne Rooney or young James Wilson as the principle striker. It may not be surprising that Ashley Young is given a start on the left hand side while Fellaini is played as a number 10 in a more direct approach which has dug the Reds out of the hole in recent games. Swans on the other hand are still reeling under the after effects caused by the departure of Wilfred Bony. Sigurdsson and Bony partnership was an important factor in Swansea’s success. But with Bony’s departure, Swans’ attack looks headless. Gary Monk will look to stifle Man United in the midfield by including January signing Jack Cork in the starting lineup. Cork is tipped to replace Jonjo Shelvey in the eleven. Gary Monk will be without Leon Britton and Marvin Emres as both of them are ruled out due to injury. Both the managers like to play an attacking brand of football which will definitely entertain both the fans and neutrals alike. United have lost just a single game in their last 19 matches, this speaks about the character of the team. If at all, the Reds intend to make the race for second more interesting, then anything less than three points in Wales would be totally unacceptable. We’re still betting on Van Gaal persisting with Falcao upfront despite the Columbian misfiring for quite a while. Ander Herrera, after an impressive outing in Deepdale, can be the shock inclusion in the lineup over Mata but the chances of that happening are remote. United would be too stubborn for the Welsh side as they somehow are getting the job done irrespective of their performances. This winning mentality of the visitors could hand the hosts their tenth defeat of the season.